I recently completed an intense Pantry Clean out Challenge. The goal was to cut my regular monthly grocery budget ($400) in half. By doing this we would focus on eating the items I already had stocked in my freezer and pantry. I was fortunate to have had many friends on Instagram join me in this challenge. I loved watching all of the progress and having a group to encourage each other and share all our frugal ideas. To find more info about doing your own pantry challenge check out my article; What I Learned From the July Pantry Challenge. My most asked question about this challenge has been, “Will you spend a lot of money on groceries in February to restock the pantry?” The answer is No. That would defeat the whole purpose of the challenge. Today’s article is going to explain how I will slowly restock my pantry while staying in budget! I have a weekly budget dedicated to pantry stock up. This is $15 per week. This pantry money is taken out of our $100 weekly grocery budget. Because it has been budgeted and planned for, restocking doesn’t require any extra money or stress. Some weeks the pantry budget is spent at local sales. Other times it’s stashed away to save for another week. It all depends on our current needs. It is very rare for me to buy just one can of soup or one bag of sugar. The way I see it, if I’m going to buy one item, and I have a few extra dollars in my budget, than I might as well grab a few more. I do 90% of my shopping using Walmart’s Free Grocery Pick (get $10 off your first order using this link). I love this service for about 1 million reasons (really. ), but a huge reason is the ability to watch my grocery total as I add and subtract items to my order. Whenever I am below my budgeted $100/week, I will add on a few more pantry staples. This helps my pantry to grow and keeps me in budget. Watch for opportunities to buy grocery items in bulk. Many groceries will be priced much lower if it is bought in bulk. This could be done by shopping local grocery case lot sales. To find a case lot sale near you be sure to talk to your local grocer. In many areas these sales might be called different names or even unadvertised. So, don’t give up easily, keep digging and talking to grocers! Another way I love buying in bulk is through a meat co-op. I have recently started buying my chicken from Savory Butcher. Their chicken is priced right and are delicious high quality. If you need some direction of what to do with your bulk chicken read my article; What to do with your bulk chicken; including 6 Freezer Chicken Recipes. 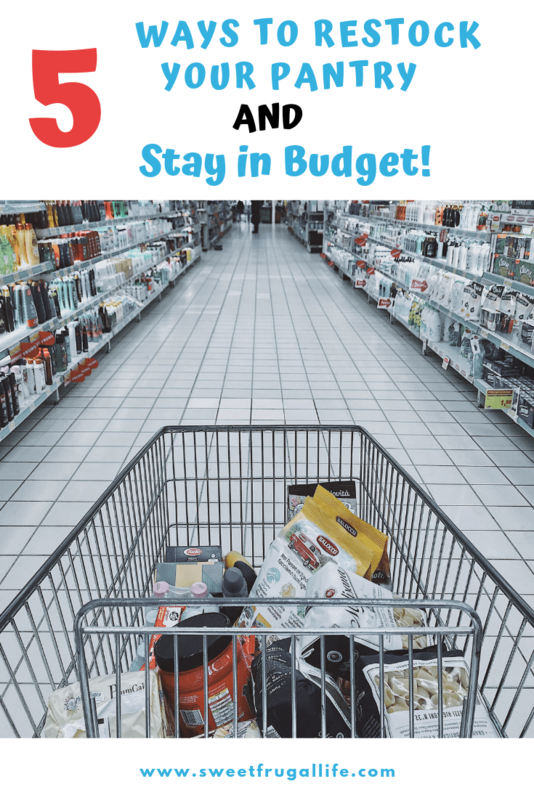 When you are trying to stock up a pantry, shopping the sales and deals will make this much more budget friendly. Whenever I find a good deal on one of our many pantry staples, I stock up (even if it wasn’t on my grocery list!). I do it within my “pantry budget,” and only on items I would normally pay full price for. My favorite app to check for deals is the Flipp app. It is completely free to download and extremely user friendly. The app is updated weekly as the new grocery ads come available. I browse it every week to find what the sales are and plan my menus/pantry stock up around those deals. Many weeks I can’t find anything worth buying, but other times I find some really great deals worth buying. Always, ALWAYS take advantage of the cashback apps available! These are not huge money savers, but every.single.little.penny adds up. Whenever I see my husband throwing away a receipt without scanning it for cashback I ask him, “Would you throw 25 cents in the trash?? ?” Of course he wouldn’t. But essentially you are losing out on free money if you toss a receipt without first scanning it into the apps. A few of my favorite cashback apps for grocery shopping are:. Ibotta: This is my most used app. Ibotta offers cashback on hundreds of items every time you scan your grocery receipt. My favorite cashback offers are the “any brand” items. These offers include items in the dairy, produce, and other grocery departments. *If you sign up for Ibotta using my link you will receive up to a free $20 bonus! Checkout 51: Checkout 51 is similar to Ibotta, in that it gives cashback on participating items when you scan your receipt. They don’t have as many offers as Ibotta, but it is still always worth checking. *If you sign up using this link you will receive $3 when you redeem your first offer. Fetch Rewards: Fetch is so easy! This is by far the most user friendly app. All you do is scan your receipt and you automatically earn points. These points can be redeemed for gift cards to just about anywhere. My favorites are Target and Amazon. I really like Fetch because you can redeem your points at as low at $3. *Use the code: W1CTU for an automatic 2,000 points ($2) when signing up. I will be using each of these 5 strategies as I restock my pantry AND stick to my normal budget. I’m not perfect when it comes to a grocery budget, but I’m trying! Just like I know we all are! What do you do to stock your pantry AND stay in budget? I would love to hear all about it in the comments!